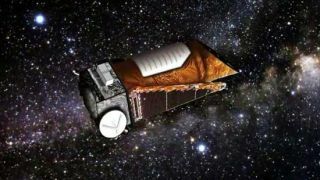 NASA will reveal new discoveries made by its planet-hunting Kepler space telescope on Monday (Dec. 5), according to a recent agency announcement. NASA will hold a press conference at 11 a.m. EST (1600 GMT) Monday at NASA's Ames Research Center in Moffett Field, Calif. Researchers will discuss new developments since Kepler's last major announcement, which occurred nearly a year ago and included a treasure trove of 1,235 newfound alien planet candidates. "The briefing will provide an update on the statistical findings since Kepler's Feb. 1, 2011, science data release and introduce a new confirmed planetary discovery," NASA officials said in the advisory Thursday (Dec. 1). — Jill Tarter, director of the Center for SETI (Search for Extraterrestrial Intelligence) Research, SETI Institute, Mountain View, Calif. The $600 million Kepler observatory launched in March 2009 to hunt for Earth-size alien planets in the habitable zone of their parent stars, that just-right range of distances that could allow liquid water to exist. Kepler spots these alien worlds using what's called the "transit method." It watches for telltale dips in brightness caused when a planet crosses in front of, or transits, its star's face from Kepler's perspective, blocking out some of its light. In February, Kepler scientists announced that Kepler had detected 1,235 planet candidates in its first four months of observation, including 54 in the habitable zone and 68 that are roughly Earth-size. To date, just 26 of these alien planets have been confirmed by follow-up observations. But mission scientists have estimated that at least 80 percent of Kepler's finds will turn out to be the real deal. If that's the case, the discoveries from Kepler's first data release alone will more than double the number of known alien planets, which currently stands at about 700. Astronomers estimate that our Milky Way galaxy likely harbors billions of alien worlds, though most are so far away that they'll be difficult to detect. Scientists detected the first planet beyond our solar system in 1992 and found the first world circling a "normal" sun-like star in 1995.